Fresh off the release of his album ‘Steve Aoki Presents: Kolony’, which apparently debuted as the #1 Album on the iTunes US Electronic Chart, Steve Aoki recently premiered the second official music video for ‘Kolony’ for his track ‘Night Call’ featuring Migos and Lil Yachty. Each video release off the album takes place in a different room of the Dim Mak Manor that corresponds to the vibe and feeling of that particular song. 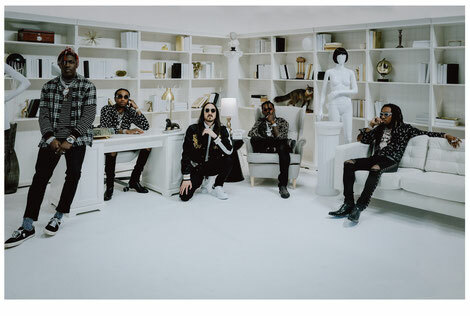 The second music video release following ‘Without U (w/ DVBBS Ft. 2 Chainz)’, ‘Night Call’ takes place in a lavish, monochromatic study that overlooks a 3D psychedelic landscape at nightfall. The video, shot in Migos’ hometown of Atlanta, mirrors the swimming sensation and off-kilter vibe provided by the track as you watch the environment around the artists take a hallucinatory turn. In support of last week’s album release, Aoki introduces his new merch line, Kolony Collection. Aligned with his streetwear brand, Dim Mak Collection, the Kolony Collection was produced with every detail in mind. Each piece is washed to give the fabric a slick, soft hand ant the trims are cut by hand to expose raw edge for a worn-in feeling. The cut of the styles were inspired by vintage tees and hoodies - oversized, drop shoulder, with slightly longer sleeves. The artwork inspired by the name and concept of the album, show ideas of unity and collaboration. The summer line is currently available via http://dimmakcollection.com with the Autumn/Winter line scheduled to drop in September.